Have you noticed that Gingerbread updates for Android devices and phones is not here yet! Carrier’s are yet to update the Android devices that they offer with Gingerbread OS, Android’s newest OS. Android lacks a developer-to-user base similar to Apple which makes it harder to push updates over the board. Many speculate this as a reason why Apple had 53 percent of its users update to its current version of iOS while Android lacks that majority. 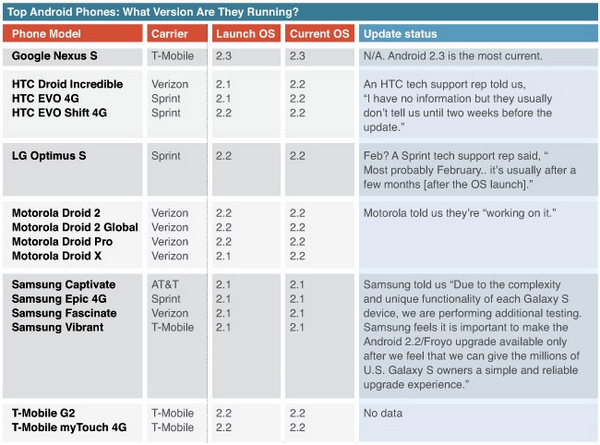 The following chart shows the list of Android phones waiting for the update. The chart was originally published on PcMag. Next Samsung Galaxy Tab 2 Specs leaked, Video Teaser Out!